The sky is falling! Click here to play! The sky is falling! Help Chicken Little warn the others before it's too late. If you can spread the word in time, you will find yourself sitting on a huge golden egg! As you're helping Chicken Little in his mission, you better keep a close eye on this little yellow character. Spin three of him across the single pay line and you could win up to 4000 coins. All of his friends are tagging along, so watch out for them as well. Spin Goosey Loosey across a pay line and you could get up to 210 coins. 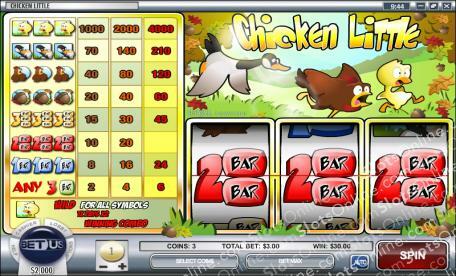 Henny Penny will bring in up to 120 coins. And of course, it wouldn't be Chicken Little without the infamous acorn. Get three of these nuts across the pay line and you'll bring in up to 60 coins. Triple, double and single BARS will also help you spin in your wins. Be sure to bet the maximum of three coins in order to activate the highest pay table. Join Chicken Little in his quest to save the town from the falling sky. If you can help him and his friends spread the word, you'll be sure to collect quite a few big wins! Chicken Little acts as a wild symbol. He will replace all other symbols to create more winning combinations. Spin this little guy in your line and he'll double your prize.